The row of historic buildings along the dirt street at the Mennonite Heritage Village in Steinbach, Manitoba begins with the General Store. Along the dirt street at the Mennonite Heritage Village in Steinbach, Manitoba, visitors can explore the historic buildings, some dating back to 16th century. In the foreground, the General Store was a popular place for the Mennonite people where they could buy the necessities needed to survive. Today, the General Store has old-fashioned candy sticks for sale along with other items and a beautiful display of local handcrafts. Beside the General Store, visitors will find the Reimer Store and down the line there is a shelter, printery, blacksmith shop, food booth, livery barn, restaurant and a steamer shelter. At the very end of the street on the same side as the General Store, visitors can browse through the sawmill shelters. Some of the other places to explore are the farm barns, the Mennonite school, various houses, memorials, artifacts and churches. Picture of some of the historic buildings at the Mennonite Heritage Village in Steinbach, Manitoba in Canada. The Mennonite Heritage Village in Steinbach, Manitoba is set on 40 acres of land where a village street represents life for the Mennonites throughout Southern Manitoba at the turn of the century. On the northern side of the street, early settlement buildings are found while the south side displays the gradual movement when business enterprises started to appear. The Mennonite Heritage Village is open year round, with some areas being closed from October to April unless a special appointment is made. 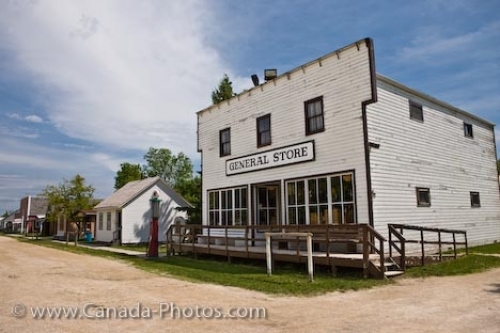 General Store along a village street, Mennonite Heritage Village, Steinbach, Manitoba, Canada.